Does a casual conversation with your friends end up with them telling you “Ang pabebe mo!” but you have no idea why? It’s either you did one or two of the things listed below, or worse—all of them. Yikes! 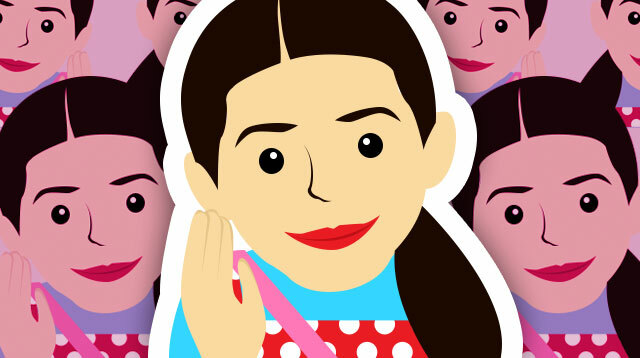 Are you a closet pabebe girl? 1. You love selfies. And your favorites? The duck face, kunwari-tulog-ako-and-I-woke-up-like-this, complete with #nofilter. Selfie pa more! 2. You talk like a toddler. “Ui, masarap ba 'yung food dun sa cafeteria?” Pabebe girl: “Masherep. Ang sherep sherep.” Facepalm. 3. You capture and post all your emotional breakdowns online. Complete with tears and a pang-teleserye levels hugot caption. 4. You don’t give a damn if people like you or not. You strongly live by the words “If you can’t handle me at my pabebe girl, you don’t deserve me at my kakai-babe.” Iba ka talaga, giiiirl. 5. Lagi kang may pinaglalaban. At hindi ka talaga mapipigilan. 7. You’re really shy. Pero kunwari lang. 8. When someone in the barkada tells a green joke, you act like you don't understand it, but you really do. So you go, "Huuuuh! Di ko naman gets eh! Pa-explain?" Uluuuul. 9. You're known for being super duper sweet. You get away with what you want (sometimes) because of your ability to mask everything with sweetness. "Sige nuuuh, pautang? Hahahahihihuhuhu." 10. So when you don't get what you want, you use your super pa-cute pouty face. "Pleeaaaaaaaseeeeee?" 11. When you and your boyfriend fight, you're the first to reach out to him, and say, "Sige nuuuuh. Bati na tayo?" With matching pouty lips and small voice. Thus, he can't stay mad at you. In fact, he's never really stayed mad at you for long. How can he resist your baby girl charm?! 12. You are obsessed with stuffed toys. Your bed is filled with hotdog pillows, stuffed teddy bears, Disney princess dolls, and Hello Kitty plush toys. Even if you are, like, 25 years old. Who is the number one customer of Blue Magic? You, that's who. 13. You have a Facebook profile photo hugging your favorite stuffed toy. With matching no-teeth smile, and your head tilted to one side. Your friends all comment, "Cute mo!" You are never hot; always cute. 14. You use words like "beh," and "sis." Also, "kuya" (even if you guys are the same age). 15. Your fashion sense depends on your mood for the day. Although you like wearing floral dresses with cute ballet flats, you also like wearing pang-sayaw clothes—MC Hammer pants, an oversized shirt, a trucker hat (worn backwards! ), and sneaker wedges. You always have two fashion options. Those are your two fashion options. 16. You actually have eyebrows, okay? But you like them soft and simple. You hate overly drawn arches! 17. You still use baby powder on your face. Pressed powder? Nah. You rely on good ol' white baby powder to keep oil at bay. 18. You hate perfume. BABY COLOGNE #4EVER!